We hope you will be totally satisfied with anything you buy from vonnybee.com If, for any reason you are unhappy with your purchase, you can return it. Under the Consumer Protection (Distance Selling) Regulations 2000 and 2005 you have a right to cancel orders for items purchased from our website within a statutory cooling-off period. This is normally 7 working days from the day after the date on which the item in question was delivered. To cancel your order, please provide us with notice either by letter or email, in each case within the statutory cooling off period and giving details of the items ordered, the order number and (where appropriate) their delivery date. We are pleased to announce that we have joined the rest of the world in the fun that is social media. Why not follow us on twitter @vonnybee to find out what’s going on with the bees this year. We can also be found on facebook at our Vonnybee Honey-Products page. Our retailers – The friend’s of Vonnybee! All over the world honey is mainly known as a food and not as a medicine. However, these days, we are now reconsidering the importance of honey for human and animal health. Many specialists from countries such as New Zealand, France and India have proven that honey is also medicinal when obtained and used under certain circumstances. Today, Honey is used externally for the treatment of healing wounds, burns, and scars. The best energy for any muscle, including the heart which is a muscular pump. Honey nourishes the gums, thus helps a better nutrition of teeth themselves. Helps with fever as Honey gives energy to the white blood cells which can then eliminate more easily the causes of the fever, i.e. bacteria, viruses. Honey is a living food with a lot of bio-energy. Honey increases the level of energy in our main battery (liver). Propolis is a resinous, sticky gum, whose colour varies from yellow-green to dark brown depending on its source and age. Propolis is one of the most valuable apicultural products. First analysis of Propolis was done in 1908 by Dr. Helfenberg ofGermany. Propolis has a five thousand year history. A Hebrew word “Kera”, meaning Propolis, is referred to in the Talmud. Propolis was mentioned in the Bible’s Old Testament. Mummification was partly Propolis. Noah’sArk, referred to as Gopher, means product of the hive or glue of the bees. Little Moses’ box was covered with Propolis. In the Talmud many prescriptions mention Kera (Propolis). The word Propolis comes from two Greek words – “pro” meaning before and “polis” meaning city. Correctly translated Propolis means “defences before a town”. There is a balm inGileadthat heals the sin-sick soul”. In 2776 BC, Anton Janshan described it as a putty wax. Amiti, Stradivarius, and Guarneiri varnished their violins with Propolis. Propolis is used world-wide in thousands of pharmacies, medical offices, human or veterinary medicine clinics. Propolis is the most important drug used in the beehive because of its anti-bacterial or anti-radiation properties. “BEE POLLEN” has been called a miracle food. Nutritionally speaking. Pollen is probably the most important “new” food of the twentieth century to be made available. Bee Pollen may also be considered possibly the “oldest” food on the face of the earth as bees and flowers evolved about the same time, some one hundred and fifty million years ago. British and French scientists who analysed Pollen found it contained 96 elements, including vitamins, minerals, enzymes, protein and amino acids and a host of others such as lecithin, a fat tissue found in the brain and blood cells. Other findings have suggested that Pollen contains all known water soluble vitamins – especially “B” and “C”, twenty two amino acids, twenty seven mineral salts, (including calcium, magnesium, zinc, copper, iron) and other elements and various enzymes. For a healthy heart we should eat foods having high B6 content. Three foods having the highly desirable B6/methionine ratio are bananas with 10, carrots with a ration of 15, onions with a ration of 10, and Bee Pollen with a ration of 400 10 1 – proving once again its unique properties. Other elements – Pollen also contains enzymes or ferments that provoke certain chemical reactions that are indispensable to the life of the cell. Additionally, Hormones have been discovered in Pollen which are a stimulant whose principal actions consists of provoking reactions at the level of the receptor tissues, with precise biological or physiological function. Recently the presence of an Antibiotic has been discovered in Pollen, a substance that, in even very small doses, has the property of detaining or eliminating the proliferation of microbes. Bees it seems collect the Pollen from plants that are amply endowed with nutrients ad ignore the poor ones. Taking Bee Pollen will not necessarily make “super” men and woman of us, but to those who use it faithfully, it will provide a certain degree of energy they may presently lack. Pollen, like Honey, was written about by many historical writers, listing its’ medicinal and nutrition qualities. Early Egyptians described Bee Pollen as “Life giving dust” to be added to their daily diet. In the Orient, Pollen and Honey were both used for medicinal purposes. Pollen mixed with Honey was used as a poultice on wounds. In Piny’s Eleventh Book of Natural History, Pollen collected by Bees from the flowers was stated to be beneficial to health. The city ofAtticin ancientGreecewas claimed to have many thousands of beehives. People were said to have come for miles around to gain the benefits of Honey and Pollen. Early American Indian women gathered flower Pollen by hand for tribal medicine men and for use in fertility ceremonies. Hieroglyphic carvings and symbols of bees, Honeycomb and Pollen have been found indicating that Aztec and Mayan Indians also used Honey and Pollen. Studies show they used it both as food and as offering to their deities. Since ancient times, Chinese have floated finely woven nets on lakes to collect flower Pollen. It was then dried, formed into cakes for storage and used in medicinal preparations. “The healing, rejuvenating and disease-fighting effects of this total nutrient are hard to believe, yet are fully documented. 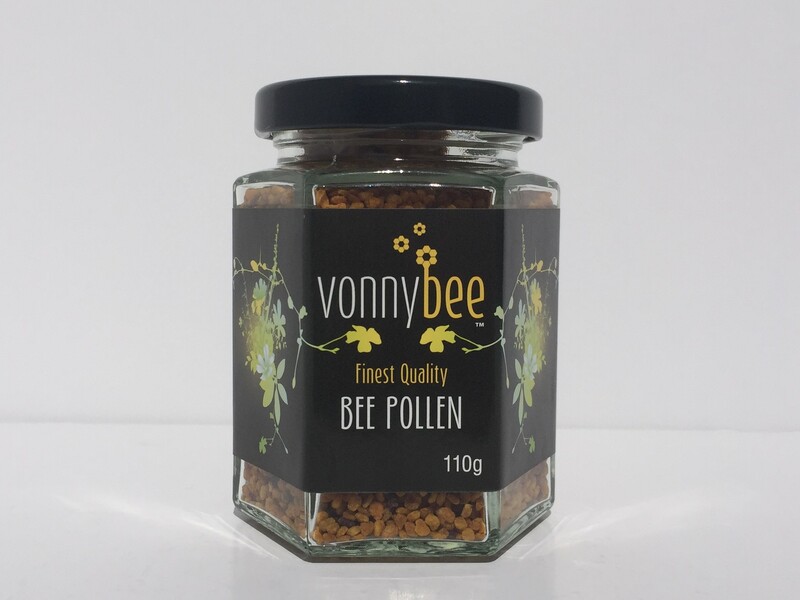 Aging, digestive upsets, prostate disease, sore throats, acne, fatigue, sexual problems, allergies and a host of other problems have been successfully treated by the use of Bee Pollen. Pollen contains hyaluronidase (and other enzymes) which is the strange, but beneficial effects of Pollen to the skin. It is assumed that Pollen absorbs into the outer layer of the skin and this is the reason for its rejuvenating properties. Honey Bee Pollen seems to be able to help correct the body chemistry to allow the body to rid itself of unhealthy conditions. Pollen has even been used in correcting errors of metabolism that may be involved in unhealthy weight gain and is a natural method of weight control. The Chinese Journal of Sports Medicine, Peijing, The People’s Republic ofChina. A study was done in 1986 on the effect of Bee Pollen and its suitable dosage in improving sports performances. Fifty athletes were divided into an experimental group and a control group. The results showed that Bee Pollen improved the cardiac function, muscular strength, and endurance – significantly.